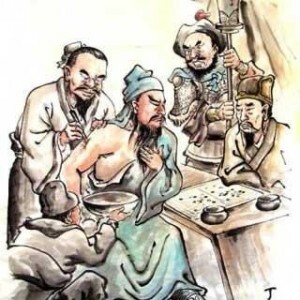 So Hwa Tou began to cut away the poisoned on his bone on General Guan Yu’s arm, while Guan Yu played chess with another general. Guan Yu was focused on the game that he did not notice the pain in his arm. Finally all the poisoned flesh had been removed and the Guan Yu was cured. Everyone was so impressed by Guan Yu’s patience and ability to handle the pain and change his thinking. They were also impressed with Hwa Tou’s surgical skills. So over 2000 years ago Chinese medicine already had knowledge of surgery and the Chinese Medicine passed down today still follows the same principles and follows the natural way.